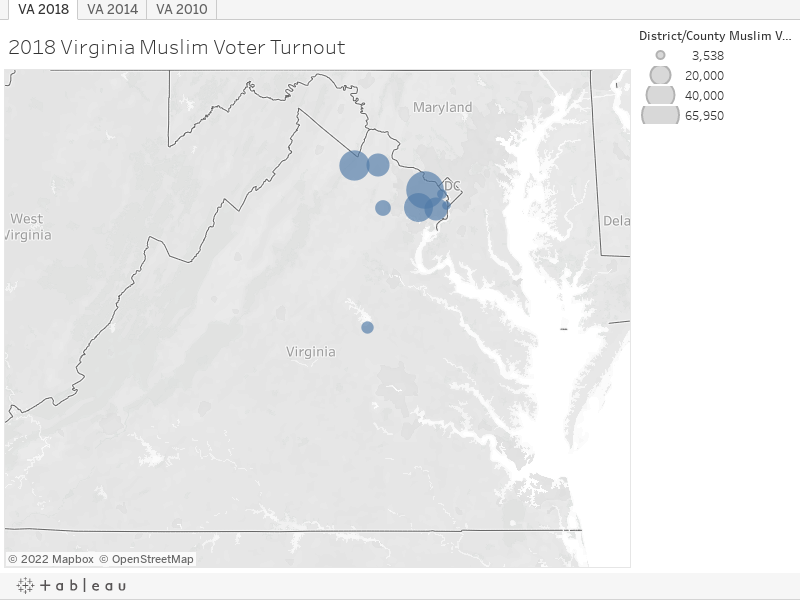 Virginia saw a 31-point increase in Muslim voter turnout between the 2014 and 2018 midterm elections within the counties that Emgage operates. Across Virginia, 60% of registered Muslim voters in the state turned out on November 6. Two of Emgage’s primary focus areas, Loudoun County and Congressional District 10, saw an amazing increase of 36% and 34% Muslim voter turnout since 2014 with the Muslim voter population between the ages of 18-34 more than doubling between the 2009 and 2018 elections. In 2009, the youth (18-34 year old) electorate was comprised of 13% of the total Muslim electorate within the Commonwealth of Virginia. In 2018, the Muslim youth electorate has grown to 30%. In 2009, turnout amongst those same Muslim youth was at 11%. In 2018, turn out amongst Muslim youth has increased to 48%. Muslim youth are now comprised of approximately a third of the total Muslim electorate in the Commonwealth of Virginia.